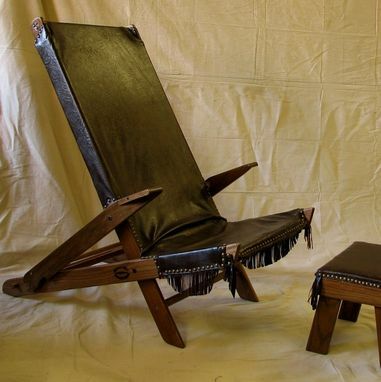 The reenactment chair features a hand finished stained red oak frame. The leather upholstery is suspended by a sling style suspension system, making this chair portable and extremely light. This chair features hand nailed decorative buttons and a fabric backing to enhance its comfort and support . The chair has two positions: casual seating or recliner. 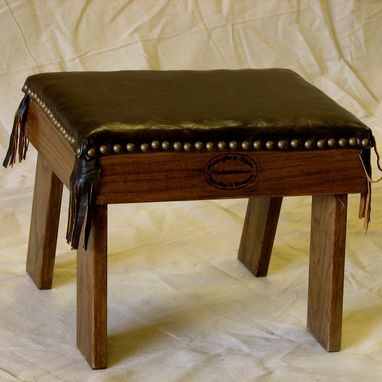 The matching foot stool allows for maximum comfort and enhances the seating experience. 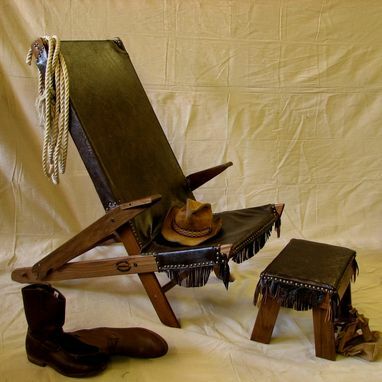 These chairs are especially favored by those who are looking for a more western theme or who take pleasure in the equestrian experience. The natural fold in the leather when in the casual seating position smooths out when sitting and provides proper support for you back and seat. Since it is sling type suspension, the chair naturally conforms to your body, relieving pressure points. 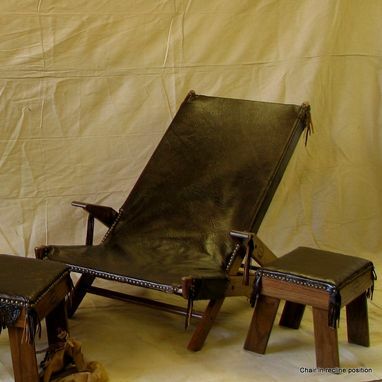 It is aptly named the reenactment chair because it looks as classic in a reenactment setting today as it would have a 100 years ago. The style of the chair is ageless, featuring the classic x-brace design. The leather features an embossed pattern to enhance its antique look. Great for reading, napping, or taking on the road to equestrian events, we are sure that you will find this chair the chair of choice at your next gathering. Also great for gaming or media activities. Set includes one chair and one footstool.